From 14th January through 11th February 2011, the Lancaster University Library showcased the recently acquired Tom Milne Archive of Popular Fiction. 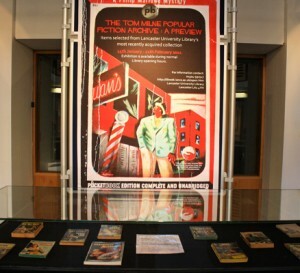 The exhibition contained dozens of paperback novels and pulp magazines. The collection is particularly strong on hard-boiled fiction of the 1940s and 1950s and on the writers whose work formed the core of canonical film noir. The archive was donated to Lancaster by Nigel Algar, Senior Curator of the British Film Institute, and the cataloguing of the collection has been financed by a generous donation from the Lancaster Friends Fund.